Jaya One is fast becoming a food hub for PJ, with lots of good choices for food and all. This time let's take a look at a nice little place called the Bee, which is an unassuming place opposite Wendy's and Starbucks, and would otherwise pass unnoticed by most. Firstly, the ambiance is a little funky, but cosy nonetheless. They have a stage placed at a little nook in the corner, for some privacy, and, on certain nights, live music as well. Their menu is full of innovative little goodies that add a twist to the usual stuff that you find on almost everyone else's menu (such as chicken chop, etc.). Of course they have burgers and fish & chips and salads and all, but again, like I said, with a little twist to it. So, one day after the weekly Sunday celebration at DUMC, our usual dilemma surfaced - where to eat with the rest of our cell group? I had suggested the Bee before, but the idea got shot down before as someone had thought it was only pancakes for lunch. On weekends, they don't serve their regular menu (maybe the chef is on leave during the weekends?!) but they do have a special brunch menu. 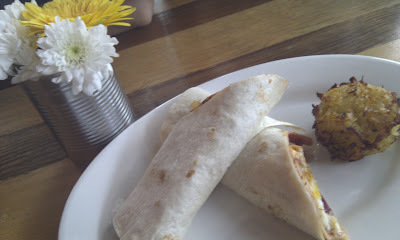 Huevos Rancheros wrap (RM17) - beef bacon, beans, fried egg, and melted cheese in a lovely tortilla wrap, served with potato hash by the side. This was light and wholesome at the same time, and the mixture just blended well together. the Bee Big Breakfast (RM24) - two eggs done any way you like them, beef bacon, sourdough bread, potato hash and other stuff. 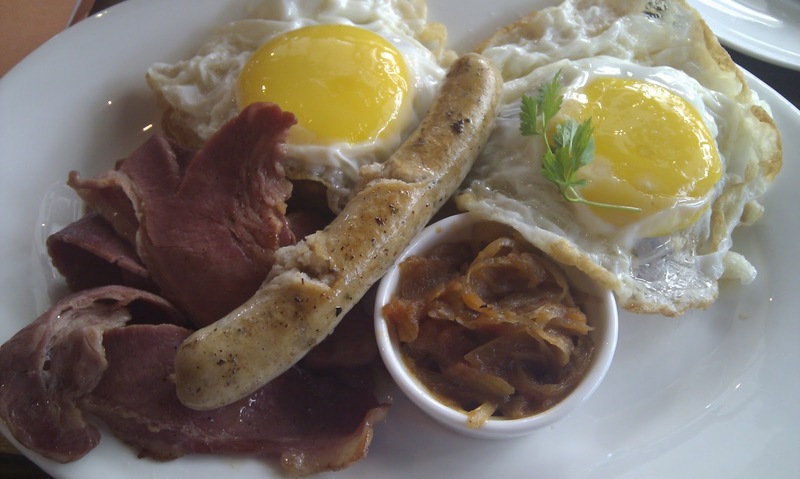 One of the best big breakfasts around. 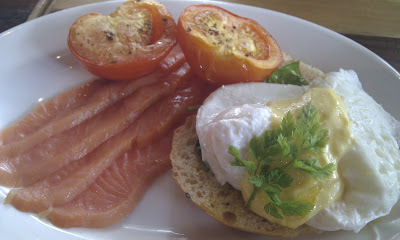 Salmon Benedict (RM25.50) - smoked salmon, with eggs benedict. What more could I say? The picture just says it all. Honestly, brunch at the Bee isn't cheap by any means (unless you're comparing to a hotel or something). But what you do get for the money, is good, honest food that's really right up there in terms of taste and quality. 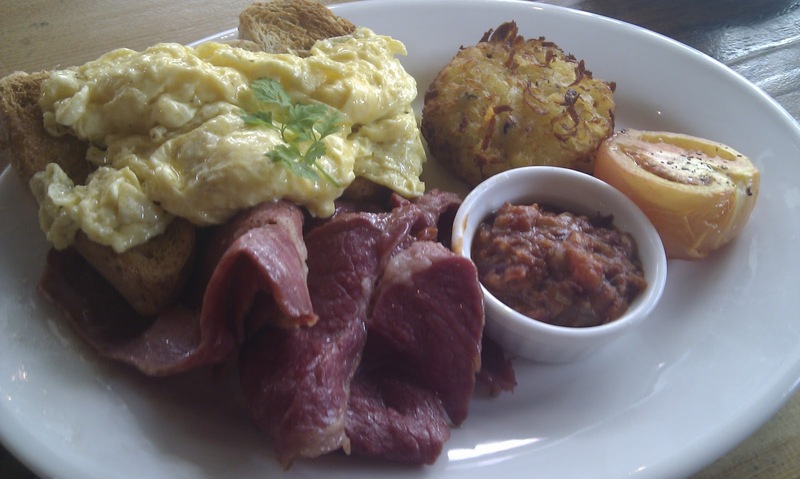 They do magic with eggs - I've never seen eggs done so well in so many varieties. Seriously, all the eggs done, whether fried, poached, scrambled - they were some of the best cooked eggs I've seen. The beef bacon was much better than the usual crud we see in most halal places, it wasn't crispy, but it had the right amount of saltiness, and certainly felt very nice and meaty. And we come to the hash. Yes, I'm a fan of McDonald's hashbrowns. They're not the best, but good potato hash is hard to come by anyway. The hash patties here blow everything else out of the water. Finely shredded potatoes, mixed with some sage and then fried to perfection... again, one of the best hash I've ever had anywhere. The only cons that I would probably have to point out really are that: it's small, and can get very crowded as they don't have much seating capacity; it's very open, so it can get pretty warm especially on sunny days; and the service can get a little unpredictable. They've got their good moments and bad moments. P/S:- had a late night drink here as well... the churros are really good too (churros are Spanish pastries, much like the Chinese yau char koay). And they've got good ice cream from the Last Polka as well. Nutella ice cream!